We decided to take advantage of the good hours of sunshine in Midwest winters and added a 36 x 14 foot sunspace to the south side of our house to replace the original porch, which was cracking up and falling off the house. We framed up the glass wall to use standard patio door glass. We discovered that the local glass companies and lumber yards wanted over three hundred dollars for each unit. We found a local entrepreneur who had found a way to get surplus glass direct from glass manufacturers. With his blessing, we took over his business. When we installed the glass in our sunspace, the results were amazing. Not only did our wood consumption drop to about two cords a year, but the sun made our home a much more glorious place to live. Over the years our sunroom has performed wonderfully, needing no modifications and little maintenance. We just wash the glass once or twice a year. 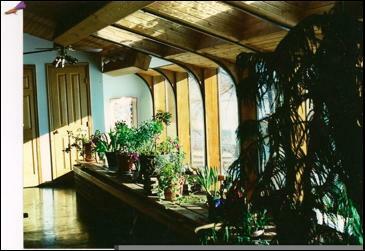 Since becoming true passive solar believers, we have built up our business. We started with one mini-pickup and 40 pieces of glass. Over the years we have sold over 90,000 pieces of glass. We started with a corner of an old barn. We eventually had three stores in three cities. In 2008, we closed the stores and moved the glass business back to a new barn we have built on our farm, which has grown over the years to 680 acres. We intend to spend our retirement helping people supply a portion of their heat with passive solar and managing the 85,000 trees we have planted on our farm. Arctic Glass supplies the highest quality product available at the lowest possible price. We offer free design advice regarding natural heating and cooling to anyone who asks. glass. We discovered that the local glass companies and lumber yards wanted over three hundred dollars for each unit. We found a local entrepreneur who had found a way to get surplus glass direct from glass manufacturers. With his blessing, we took over his business. and little maintenance. We just wash the glass once or twice a year. I live in pacific NW. Little sun but am interested in more information.